shopDisney is keeping the holiday savings rolling with a Cyber Tuesday offer. Today only, take an extra 20% off some of the hottest holiday items of the season. Below, we’ve rounded up a few of our favorite items available today at a discounted rate. To purchase with an extra 20% off, use the promo code MELT4THIS. This 19-piece Castle of Arendelle Play Set lets your little one recreate favorite moments from “Frozen” and “Olaf’s Frozen Adventure.” The set includes four articulated mini-dolls: Anna, Elsa, Kristoff, and Oaken. Olaf, Sven, and troll figures are also included. 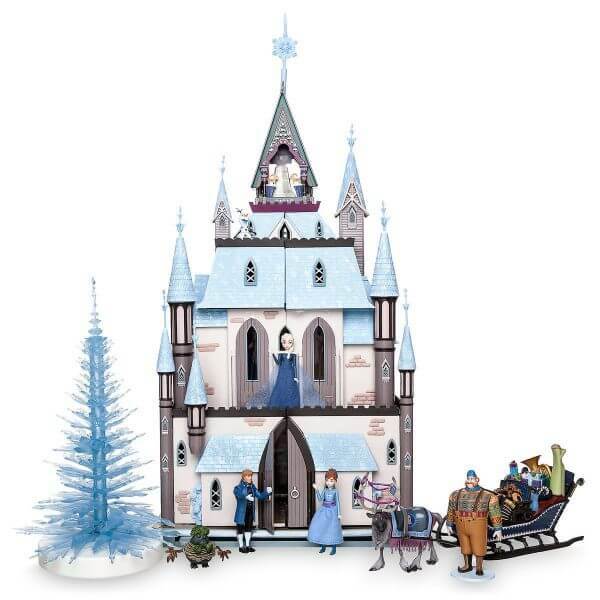 The three-level castle features a glittering roof and opens up for playtime, and it comes with a light-up ice tree. This special souvenir Walt Disney World ornament adds memories from each park to your Christmas tree. Miniature sculptured icons include Cinderella Castle from Magic Kingdom Park, Tree of Life from Disney’s Animal Kingdom, Spaceship Earth from Epcot, and Hollywood Tower Hotel from Disney’s Hollywood Studios. 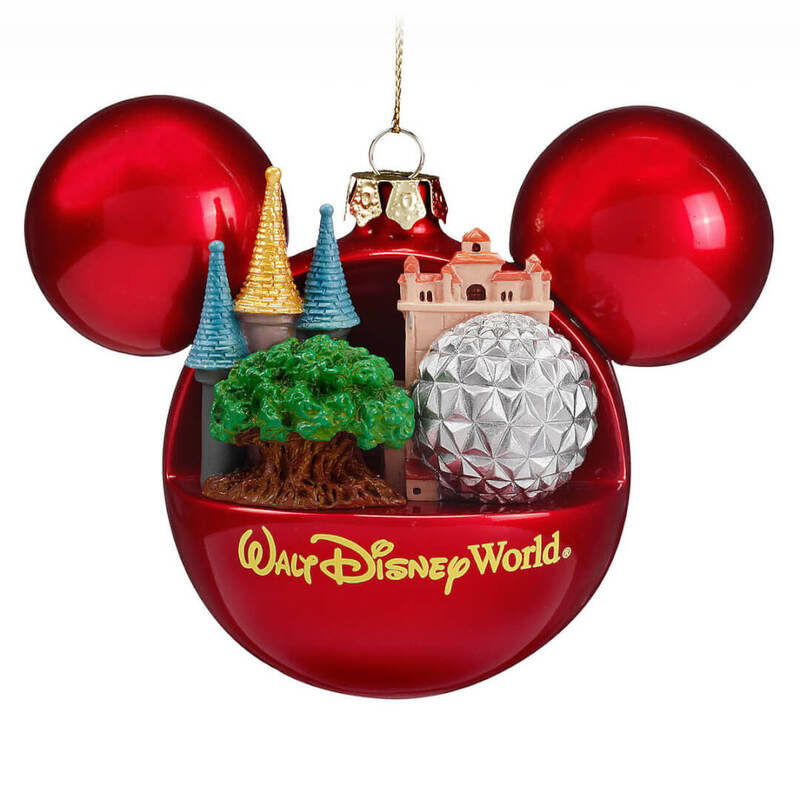 The Mickey Icon ornament has a semi-gloss finish and golden cord for hanging. 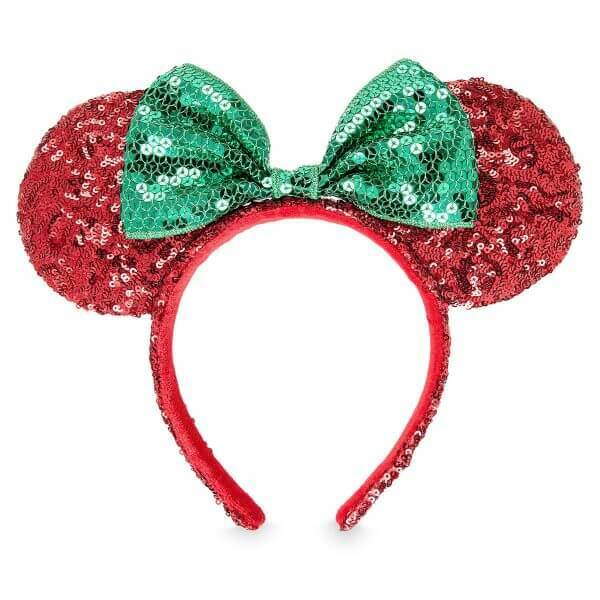 Stylish Minnie Mouse Ears are a must-have accessory, and this festive holiday version makes a great gift. Surprise your loved one with these sequined, padded ears with a contrasting sequined bow. A velour no-slip interior band makes them extra comfy. 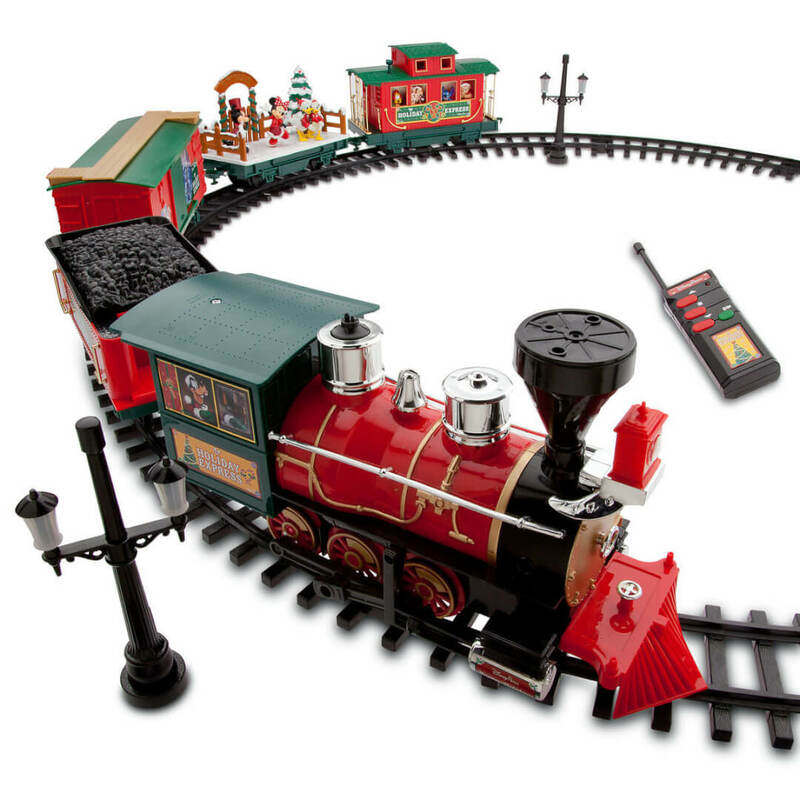 This 30-piece train set includes locomotive, coal tender, skating carol car, caboose, box car, 12 curved tracks, 10 straight tracks, two lamp posts, and a remote control. Characters include Mickey, Minnie, Donald, Daisy, Goofy, Pluto, Chip, Dale, Stitch, Tinker Bell, and Duffy. The characters in the caboose move up and down as the train travels the track, and Skating Minnie spins during the trip. Your train-obsessed Disney fan will love waking up to this fun holiday gift. This adorable holiday sweater is the perfect look for all your family gatherings. The thermal weave front features Mickey Mouse appliqué with 3D scarf detailing. 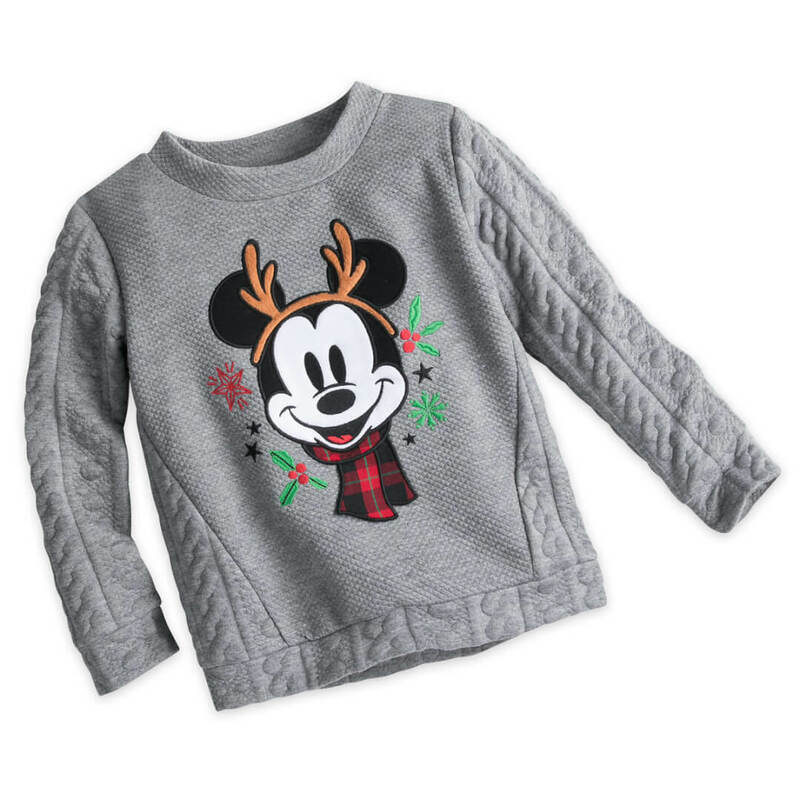 The sleeves, hem, and back have a textured pattern, and the back also features Mickey icons. Combine it with holiday sweaters for Women, Men, and Baby to create a festive Disney outfit for the whole family. Many more items are currently on sale as part of shopDisney’s Cyber Tuesday sale, so head over to their website to see the full selection.